Thank you to Gary White for letting us know how blooming 2015 is happening in Lincoln, Nebraska. The next day, April 16, I had my first MDB – Libation, in bloom. 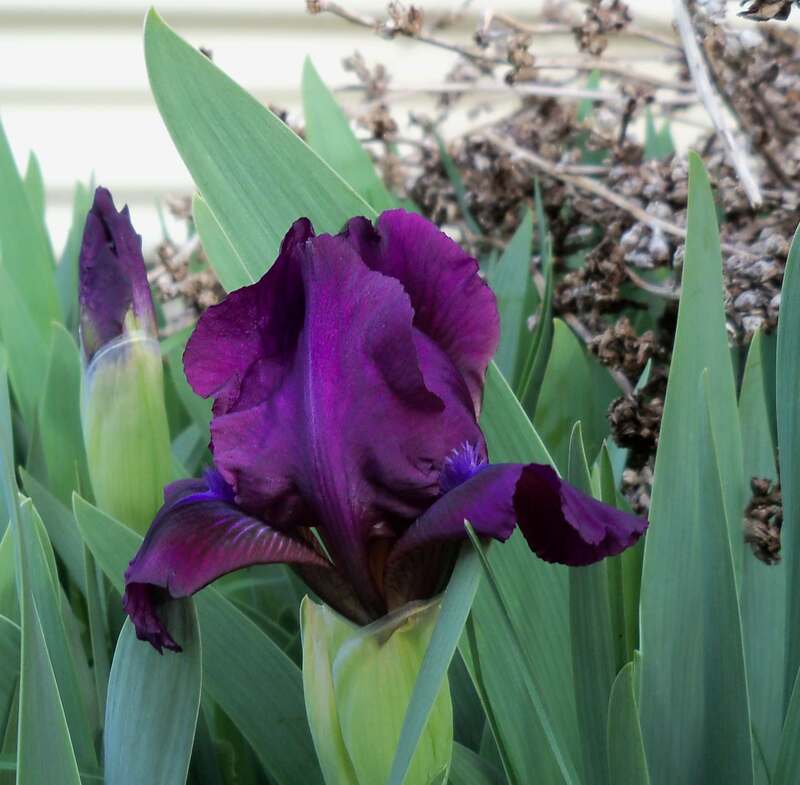 The next few days there were numerous irises coming into bloom, including 3 more MDBs – Grey Pearls, Minikin, and Zipper. Rose Mist is an H.P. Sass iris from 1931 and was listed as a DB in the 1939 checklist. DB irises (for Dwarf Bearded) included all irises up to and including 17 inches in height. Rose Mist today would be included in the SDB class, but there was only one class back then for all dwarf irises under 18 inches in height. The Iris Encyclopedia lists Rose Mist as an MDB based on the DB designation in effect in 1939. Rose Mist started blooming on April 19. We have 31 other SDBs in bloom now. Those include (in sequence of bloom): Just A Croc, Cup Cake, Cherry Garden, Wow, Knotty Pine, What Again, Ooh La La, People Pleaser, Minikin, Jilleroo, Pink Fawn, Sweet N Neat, Smell The Roses, Seventy Seven, Jewel of Jakarta, Plum Perfect. Then yesterday, the following 8 came into bloom: Doe Z Doe, Wedgewood Blue, Being Busy, Blue Denim, Do Si Do, Blue Mascara, and Ice and Indigo. Today (April 23) the following SDBs opened the first time this year: Irish Chant, Petite Polka, Rosalie Loving, Acey Deucy, Limpid Pools, Born Free, Abba Alias Abba, and Neutron. And the most amazing iris to bloom this early is an unnamed Siberian iris I have had about 4 years. It started blooming about 5 days ago and is an almost electric blue, with numerous open flowers today. None of the other Siberians are even showing buds yet. It was extremely early last year as well, so its in its genetics, I think. I will have to look into saving some pollen and making crosses to obtain very early blooming Siberians. Several of the irises are historic (introduced prior to 1986), and 15 of those listed above were introductions from Allan Ensminger, a Lincoln hybridizer. Can you help us identify what is blooming when and where this year? You can see all the entries we have so far by clicking on either the tag bloom time or the category bloom time at the bottom of any of the individual entries. Note the iris links go to the Iris Encyclopedia entries for the respective irises. It’s that time of year when we start expecting to see, or maybe already have seen. the first irises. Which can be very variable depending on the weather and maybe other influences. With that in mind, we thought it could be helpful to have information on when irises are blooming in the Region in more or less real time. Then you, your friends and neighbors, and visitors will know when to see the irises. When/where to see the early irises. When is the peak bloom time in your garden this year? When is the best time to see public displays in our Region this year? Hopefully all of these will be addressed. As a start, here is our first bloom of 2015 on April 15th. It is ‘Ruby Locket’, a SDB listed as midseason bloom. It has consistently been our first bloomer, probably partly due to a semi-protected location on the south side of the house. Location: Central Iowa, south of Ames. Previous years: April 2, 2012; May 11, 2013; May 5, 2014. Do you have some bloom observations we can add to the list? You can either leave them as a comment or email the webmaster wrmesser@gmail.com to have them added. Thank you. You probably do not need this; because you are already here. However, it’s something to share with your friends: The Region 21 website has a new address. It is now aisregion21.org (with or without a www prefix). The AIS list of Regional Websites has been updated; but, there may be other sources still having the old address (which was dot com rather than dot org). You can help us by letting us know where they are or updating them yourselves. Thank you for encouraging everyone to get the new address.